Dandelions. Weed or Salad Green? The answer is: both. 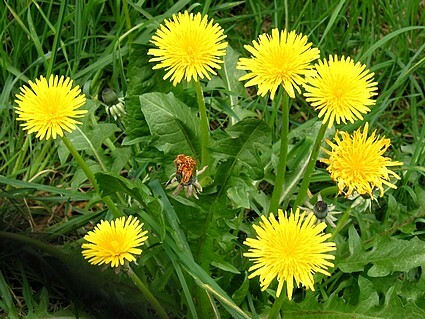 At this time of year, growing up in Queens I would see people walking aside the Long Island Expressway pulling dandelion weeds, which I thought was very neighborly of them to do. There was an abundance of them along the highway and fortunately people would not walk their dogs on the other side of the highway fence. However, even at a young age I questioned their judgement, as I felt that carbon monoxide, that silent killer that we all grew up fearing, was the poison that these very plants were filtering. You may not inhale it, but was it possible that you could ingest it? Not sure, but I never wanted to test that out. To this day, even though they grow wild and unscathed by herbicide in my back yard, I hesitate to throw dandelion greens in the family lunch. There are many such plants that scattered around backyards, and are there for the snacking. My reluctance to try many of them is the fact that I feel if it were good to eat, the bunnies and deer would have beat me to them.